-Rub the prawns using salt and lemon. (I usually apply it all over the prawns and leave it for 15minutes. )Wash under running water 5-6 times until all bad odor disappears or else repeat the first step. -Marinate the prawns using the ingredients listed above for 1/2 -1 hour. -Wash the basmati rice and soak in water for 30 minutes. -Heat ghee in another pan and fry the cashews,raisins.Keep aside.Fry the rice in the same ghee for 2-3minutes after draining the water. -Place a cooker with 3cups water,add salt and the other spices listed under cooking rice .Bring to boil and add rice.Keep on medium flame.Cover and cook till the water evaporates and the rice is cooked.Put off flame. -In the mean time,Place another pan on medium heat,add oil .Saute onion till translucent.Add the green chillies,curry leaves,coriander leaves/cilantro,mint leaves.Saute and add the ginger garlic paste. -Add the chopped tomatoes and cook till mashed. -Add all spices listed to prepare masala and saute for 2 minutes till the raw smell of spices vanishes. -Add a cup of water and salt.Bring to boil.Add the marinated prawns to it. -Cover and cook for 15minutes till gravy thickens.Keep this in low -medium flame.Add the cooked rice on top.Squeeze the lemon juice on top. -Cover or seal it tightly using maida or atta or a tight lid and leave for another 15-20 minutes on low flame. -Heat another pan with 3tsp of oil and saute the onion for garnish (I have skipped this)till brown and add to the cooked rice along with fried cashews,raisins and chopped cilantro . -Serve it with raitha, papad & pickle!! *You can fry the prawns if you want it more tasty. *You can also skip the fried onions for garnish too.I have skipped too. * The spice level is on a higher side,if you wish a milder version- please reduce your spices esp pepper powder and green chillies according to your taste buds. *This is a low fat version of prawns biriyani with very less oil and ghee.You can increase the ghee amount. 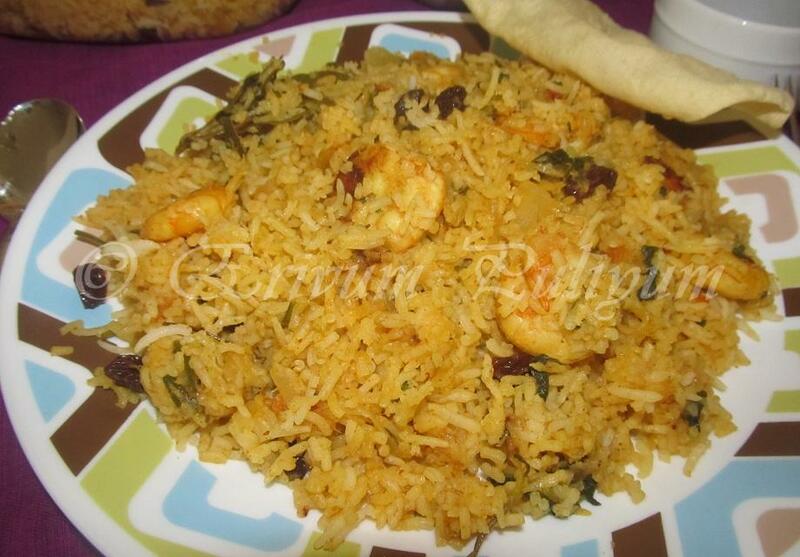 Absolutely inviting prawn biryani. Looks perfect. That's awesome Julie..I keep away from prawns..Yet seeing this made me drool. you have a very nice blog , I have an award and an interesting game waiting for you at my blog please feel free to collect it . Real feast to sea food lovers like me, wat an inviting briyani. beautiful dum biriyani......wish i was invited!!...hahaha! yum!i have my plate ready!mouthwatering. Never tried cooking prawns other than chicken and fish. My husband love it. Will try for him. Bookmarking it. 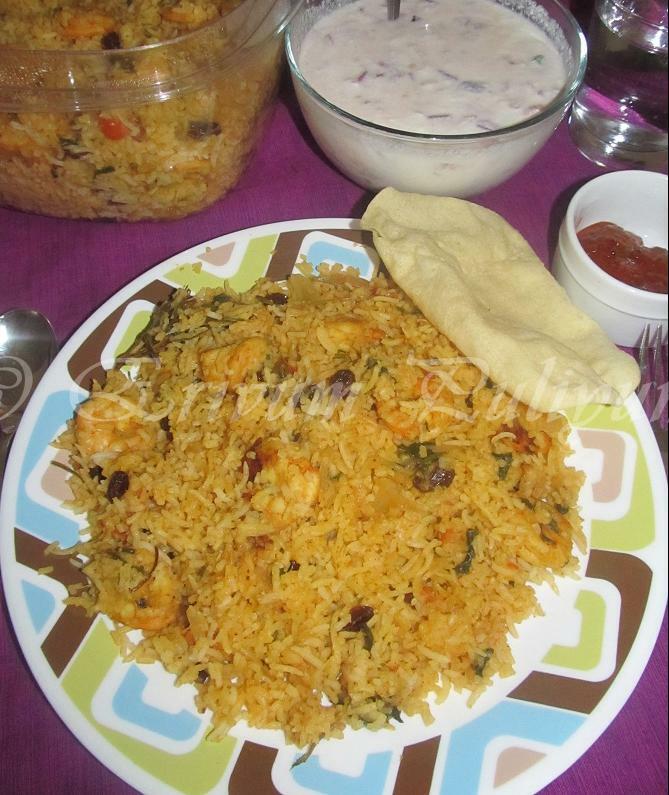 Julie, I just love prawn biryani and your version is wonderful, loved it! have you tried the masala with ground almond, coconut milk and yoghurt? it's yumm!! Yummy, flavorful biryani, looks great! Julie I am no cook when it come to cooking non-veg food. But eating it yes. Especially something that is so beautiful and promises to be as delicious. This would be such a great change from the usual Chicken/Mutton biryanis. I would love to have you link it up with my Virtual Eid Potluck Party. wow... delicious and flavourful biryani... yummy! 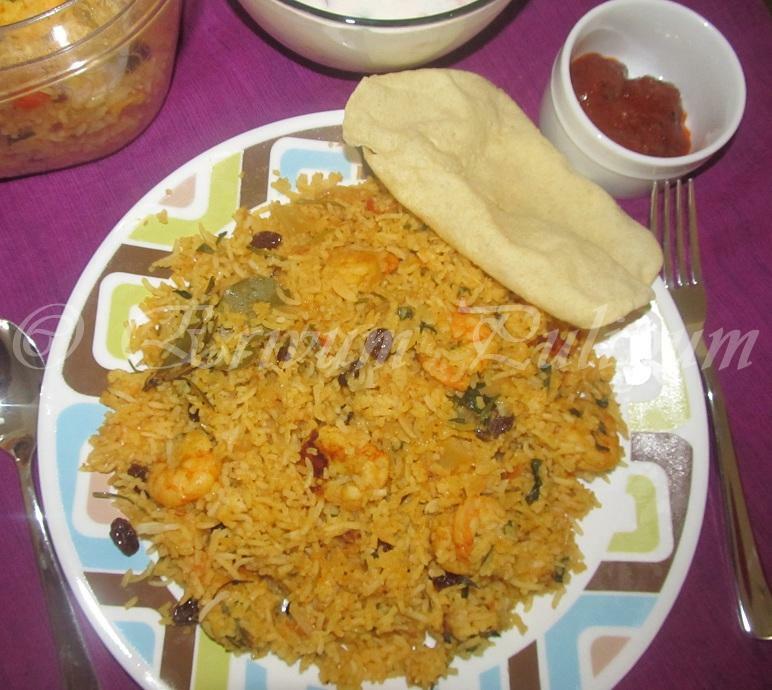 Mouthwatering prawn biriyani Julie....just great!